West Yas Two ... a concept. Aldar Properties, a leading real estate company based in Abu Dhabi, has launched the second phase of sales for West Yas, a masterplanned residential development located on Yas Island. This comes in response to the strong nationwide demand recorded in Phase One where 300 units were sold to Emiratis. Talal Al Dhiyebi, chief development officer at Aldar, says: “We have seen significant demand for West Yas due to the elegant design of the development’s luxury villas, and its prime location on one of Abu Dhabi’s leading retail and leisure destinations, Yas Island. West Yas, the next phase of the Yas Island story, appeals to Emiratis from across the UAE who are looking for a long-term investment opportunity, in addition to luxury community living that will enable tenants or owner occupiers to live and work in the capital. 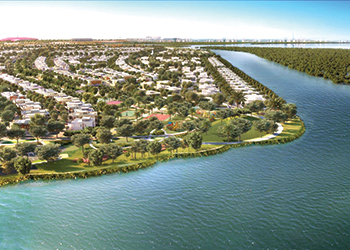 With over 1,000 villas making up West Yas, it is expected to become a major destination in its own right, with a significant emphasis on creating quality of life for our residents. West Yas features 1,017 four- and five-bedroom luxury villas, with prices starting from Dh4 million ($1.09 million). The development’s facilities include a mosque built for 2,000 worshippers, an international school, a retail centre, sports facilities, a petrol station, and extensive landscaping and greenery in the open public spaces. The villas are scheduled for handover by the end of 2017. Dubai-based developer Buroj Property Development plans to invest €4.3 billion ($4.8 billion) to build a luxury tourist resort near Sarajevo in what could be the biggest foreign investment of its kind in the Balkan country. It will be located in the municipality of Trnovo which lies below the Bjelasnica and Igman mountains. “The initial investment in the project is worth around €920 million ($1.01 billion) while the total investment will amount to €4.3 billion over the next eight years,” says Ismail Ahmed, the company’s manager. He says the Buroj Ozone will stretch over an area of 1.3 million sq m and include thousands of housing units hotels and the largest shopping centre in Bosnia. Ahmed says construction will begin in April or May next year pending a resolution of regulatory issues and necessary permits from the Trnovo municipality, which will lease the land to Buroj Property Development for 99 years. Bosnia has seen an influx of tourists from the Middle East in recent years and a growing number of Middle Eastern buyers of properties attracted by the country’s mountain landscape. Lease interest in the much-awaited Dragon City, a Chinese themed retail and wholesale development in the masterplanned Diyar Al Muharraq project in Bahrain, has reached 100 per cent while the occupancy rate is at 90 per cent. Meanwhile, work on Dragon Apartments in the city is totally complete and the first group of residents is due to move in their apartments soon. Occupying a total land area of 20,000 sq m, the apartments comprise six multi-storey residential buildings of four and six floors with a total of 300 apartments. The Dragon Apartments were developed by Bin Faqeeh Real Estate Development Company, while Banz Group was appointed for Warehouse Management and Logistics Services for Dragon City. The Dragon City concept was launched in May 2012. Ghesa has been awarded a contract to install water effects at the Dragone Theatre in Dubai’s Al Habtoor City, the UAE. The water effects, the first and biggest of its kind in the Middle East, are currently under installation and expected to be finalised by mid-2016. The project will be the first permanent water production theatre in Dubai and region. Ghesa has more than 50 years of experience in the design and installation of ornamental and cybernetic musical fountains, as well as in multimedia shows. Since 1963, it has installed more than 3,000 fountains all over the world. Some key ones include the biggest floating multimedia fountain in the Middle East (Sharjah, UAE); 187 fountains at the Princess Nora University for Women in Riyadh, Saudi Arabia; Sheraton Park water features in Doha, Qatar; City of Dreams water features in Macau, China; and the largest multimedia fountain of Latin America in Brasilia, Brazil.